Defense Ministry and Aerospace Industries launch new satelךite from Palmachim base. Some worry over early indications of malfunctions. The launch of Ofek 9. Archive. 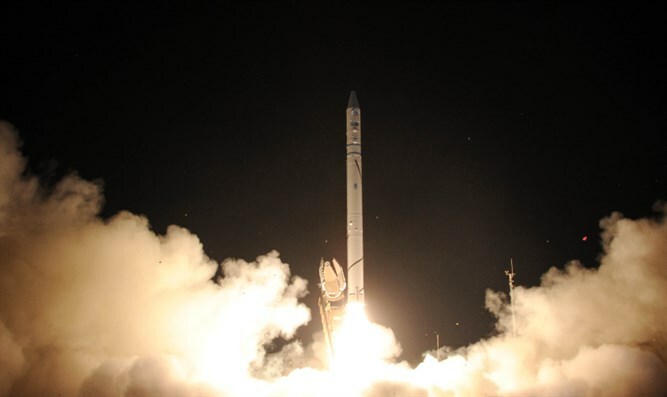 The Defense Ministry and Israel Aerospace Industries successfully launched reconnaissance satellite "Ofek 11" today (Tuesday). The launch took place in the afternoon from the Palmachim base in the south. Ofek 11 is a photography satellite launched for the purpose of intelligence gathering, and can cover the entire Middle East. The launch was planned for yesterday but was postponed due to weather conditions. Leading up to the launch, access to the base was cut off, and reconnaissance aircraft took off toward the Meditteranean. The satellite went into its planned orbit around the Earth and contact was established with it, but there is some worry within the Defense establishment following negative indications. Amnon Harari, head of the space department in the Defense Ministry, said: "We made contact with the satellite, we know it entered its orbit going around the earth every hour and a half. "We are in continued contact with the satellite and are monitoring its condition. There are indications of some things that aren't working as we expected. We're trying to stabilize it, and this will take a few days," Harari explained. The last Ofek satellite, named the Ofek 10, was launched into space around 2 years ago, in 2014.